How Do I Get Odors Out of Clothing and Linens? If you remember my post about “How to navigate a thrift store,” you know that I am intimately acquainted with the Goodwill/thrift store smell. To me, it represents not just potential, but “choice” and I embrace it. Yet, I know that it’s not the case for many of you. 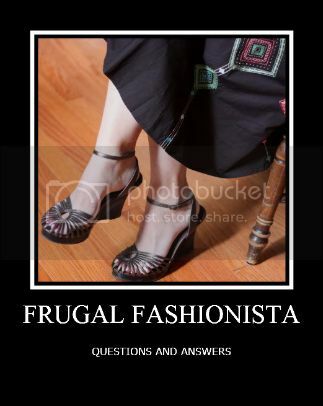 After my Frugal Fashionista articles, where I share designer outfits for under $15, I receive many related questions. I have decided to address some of these in my posts so that everyone can benefit. I frequently get asked about that peculiar thrift store smell…name it whatever you want, but it’s there – with some stores being much worse than others. Personally, I have only had one article of clothing that needed repeat washings. I just couldn’t figure it out, but narrowed down the problem to its synthetic make up. I do think odor is much harder to get out of synthetic fibers. Here are some general suggestions for what I have done to get any kind of odors out of over the years (and with three boys that play football, we have odor issues. :)) This is by no means an exhaustive list, but things that have worked well for me. I always do a smell test. Yes, I know it sounds odd, but if for some reason there is a really strong odor beyond your typical “thrift store” find, I don’t buy it. You should see me action, it’s pretty funny. I do the smell test for ALL of my second hand purchases. Hang it outside in the sun. There’s nothing I love more to get rid of any subtle smells than a wonderful air drying. ***(This is what I do if I have to take it to the next level). Try adding white vinegar and baking soda to your next load of clothes. Depending on the size of your load, I would add approximately two cups of white vinegar and one cup of baking soda for a full load and heavily soiled clothes. This is a wonderfully natural and frugal alternative that many use in lieu of regular laundry soap. The vinegar and baking soda neutralize each other and really take out any smell. I add them both at the same time, but if you are an “attention to detail” person, add the baking soda in the wash cycle and then the vinegar to the final rinse cycle. I have mix and matched numerous varieties with white vinegar, baking soda and Pine Sol for washing and cleaning. If you just have one item, you can always soak it first in white vinegar, and or baking soda and then wash regularly. Again, check odor before drying to see if it needs to be repeated, but I really think this should kill any lingering odor. Jessica from Life as She Sees It commented, “Tea tree oil works really well for this job. It disinfects and leaves the clothes smelling great! Just a few drops do the trick.” I haven’t used Tea Tree for clothes, but I have used it for many other things. You can purchase it at any health food store and is a great essential oil/ herbal remedy. My final, but least favorite option, is to have the item dry cleaned. If it’s a quality item, like my new leather coat, I would be willing to invest the money to have it professionally dry cleaned and pay them to get out the smell.. Our dry cleaner guarantees their work, and if it was a high end designer piece I would weigh the pros/cons of taking it to them. I would love some help from you Home Managers. I have only addressed those remedies that I have tried personally, but I know there are other options out there. What do you do to get odors out of clothes or linen items? Well, you could always try Febreeze and see if that helps at first if it’s not too bad. hi Cheryl – Febreeze does a wonderful job of masking the smell but doesn’t actually take it out when just sprayed (but I still love it… :)). I did just recently hear of a recommendation of spraying it on the odor and then washing….I may test that out. For colored loads, I don’t recommend it on your fine items, but I use just a cap full in all my kids colored loads. I add it up on top where the bleach thing is in my washer and haven’t had any problems. I’ll have to research some more specific tips because I would hate to ruin anyone’s clothes, but I do it daily and have never had bleach spots at all, probably because I use such a small amount. I always use vinegar its seems to work – not to mention it will keep you dark clothes from fading as fast. On whites I have used borax. I use to manage a charity thrift store and we would try to weed thru the stinkies. Your bigger thrift stores don’t usually. You would be amazed what people will donate! I have to agree with you. There is nothing like hanging clothes in the sun and fresh air to freshen things up! I actually wanted a line to dry my clothes on and found on second hand. I love it in the summer when I can line dry our clothes. There is something so relaxing about hanging things out to dry! If you hang things out in the sun to air them, turn them inside out to keep them from fading. I learned this while living in Asia where a dryer is rare. And, make sure you tuck in the collars or you’ll get a two-toned garment. Peroxide will take out a wide range of stains and the smells that may be in fabrics. It is cheap and breaks down to just water. We use it all the time with four little ones and it’s all I have on my shelf for pretreater. I have a friend who swears by a small bit of bleach in her color loads of laundry but I haven’t had the nerve to try it myself! I also do the smell test in the thrift store. I try to be very subtle about it at a garage sale though as I don’t want to offend but in the thrift store I just sniff away and don’t worry about people giving me odd looks! The thing I smell for is cigarette smoke. I am allergic to it and can’t bear the smell so it’s very important for me to avoid it. I once bought a jacket off ebay for my son and forgot to ask the seller about smoke and when I opened the box the smell almost knocked me down! I washed it countless ways, countless times and even left it out on my clothes line for two weeks (including in the rain) and never could get all the smell out. Had to get rid of that one. I personally use Dryell alot – home dry cleaning system – it works wonders, especially for those items that DO claim to be dry clean only!! I don’t have any tips for removing odors – it’s usually not been a problem for me after one wash. BUT, I wanted to share the awesome trip to Goodwill we had this weekend. I got 10 pairs of capris, including 3 Tommy Hilfigers that looked brand new (and the rest were all name brand, too), a new pair of Nike sneakers, and a new pair of Sketchers sneakers for my 5 year old, a pair of Hilfiger shorts for my 7 year old, a couple of Christmas decorations, and two boxes of baseball cards for $60. Ordinarily, that’s more than I’d spend on one trip, but good grief! The shoes alone would have cost more than that! And I’ve got MORE than enough to get me through Spring and Summer! If a secondhand item is obviously clean (especially NWT items), but has a bit of the funky store smell, I steam it. Before I fill the steamer, I mix 2-3 drops of essential oil (rosemary or eucalyptus work well) into the water. I steam the item until it is good and damp, and then hang it outside in direct sun to dry. Works every time! I use the “sniff test” in stores! I am particularly careful with purses, shoes, and books, as mildew and smoke smells are tough to get out of these items. I did manage once to save a (very cute!) nylon/fabric purse with a mildew smell that slipped past me; I scrubbed the exterior using a scrub brush and then laid it in direct sun for a whole day. I had to repeat this process 3 or 4 times, but now this is one of my favorite summer purses. Still, I passed up a gorgeous but mildewy Banana Republic leather purse last week, since I wasn’t sure I could get the smell out of leather. I wrote a post about the “moldy” smell in clothes a while back. There’s a great book on the market (and cheap too!) which suggested pouring 1 cup of white vinegar into the washing machine and allowing the machine to “wash” them. It works! Febreze has a product that is specifically for washing and it works wonders! Find it in the laundry aisle at the store. I used it on some clothes that my SIL borrowed and came back with that nasty cigarette smoke smell. Its not a “natural” cleaner that some prefer, but it was a lifesaver for me. @Becky, I totally agree. I received some maternity clothes through freecycle…..really cute ones but the previous owner was Indian and the curry smell from her cooking was overwhelming in the clothing. I tried all my normal tricks to get rid of the smell. The Febreze solved the issue. It’s a little pricey, but in some cases well worth it. I was lucky….my mom had some and let me use some of hers! Moth balls, especially if you smell a strong camphor smell, these items really need outside air. I put a few drops of peppermint castille (like Doc Bronnor’s) soap in my washing machine with anything I’m trying to get a smell out of. Works wonders. Stuff may come out with a minor peppermint smell, but that dissipates rather quickly plus, the peppermint smell isn’t unpleasant. 1) BORAX works wonders at getting odors (especially musty/moldy smells) out. Just add to your wash load. Works in HE washers too. 2) DON’T use fabric softener…yes it smells nice, but it “coats” the fabrics and acutally makes it harder to get any remaining odors out! I leaned both these tips when trying to deal with some musty towels. I have successfully used white vinegar to get odors out of clothing. Just pour a cup in with a small load and let it soak. It is a natural product and works great. It may take another normal wash to get the vinegar out. It is cheap and something I always have on hand. Also, for those of you who find an old sippy cup with milk still in it, put the cup and liquid in a bowl of water that has been brought to boiling with a 1/2 cup of vinegar, soak for a couple of hours and wash as usual. The smell will be gone. freezer (i leave it over night) and then wash it as normal! Works for me! Thanks for the tips. As a second hand shopper for most of my life, I’d like to recommend Dryel for clothes with an unpleasant odor. I have used this on numerous occasions and it works wonders. You can use it on dry cleanables and washable clothing! Thanks, Jen for a great blog! I always use white vinegar as a softener, and didn’t even realize it helped get rid of smells! I love washing our clothes and drying them outside on our lines – very rarely does any ‘smel’l remain after the fresh air treatment! On rare occasions, I need to get tough with odors – my favorite smell remover – OxiClean – it works wonders on stains but also removes strong odors. If the odor is bodily fluids or stomach contents, an overnight soaking in Borax is my first line of attack. I think getting your thrifted items ‘clean’ is all part of the challenge – and if it’s half price day, I’ll risk a small stain even. Our Goodwill takes things back within 7 days as long as the tag is still on it, so I can try to get the stain out before removing tags and if it doesn’t work, I can take it back! Hi there, I haven’t read through all the comments yet but wanted to say that using an unscented laundry product is usually better because it won’t cover up the smell. I make home made laundry detergent and use it on everything. I have a slightly different variation for whites. But I have been using either “green” or my homemade laundry detergent and can’t BELIEVE how clean our clothes get. Even the thrift store smell. 🙂 I’m like you Jen, doesn’t bother me one bit. one more thing, I use a tiny amount of bleach in the dispenser as well and I fill the rest with water so when it does go down in it’s even more diluted! If nothing else is working to remove mildew smell from your towels and clothing Smelly Washer and Smelly Towel Cleaners guarantee to remove odor and keep it away! Each bottle has 24 ALL NATURAL treatments at a cost of less that $0.71 per cleaning! I have an award for you over at my blog! My friend confirmed what I thought I remembered – it’s the detergent sold in the hunting department/store to help prevent the hunters from smelling. She said the brand she was told about is called Scent Away, but they just bought whatever they found at their store, and she doesn’t remember what it’s called. I was sent a product to try from smellywasher.com and it helped with my smelly towels. I don’t know if it would help with the thrift shop smell or not. A can of coke gets rid of the smells! One great way to remove odors from natural fiber clothing is to use an enzymatic laundry product. I use Sun and Earth but there are many other brands, usually found in health food stores. I wash all my whites in any temp water but I have found that anything with a color should be washed in cold water because the coloring can come out. This type of laundry soap is best for natural fabrics. Enzymatic laundry soap lifts off grease and residue, making the garment cleaner, it doesn’t rely on chemical brighteners or strong fragrances that mask the dirt. It works great on greasy stains if you put it directly on the stain. Another way to utilize baking soda and vinegar on natural fabrics is to put a cup of baking soda in a sink with water and mix well. Soak the clothing in this for a morning making sure the whole thing is saturated. Then drain the sink and soak the clothing in 1 cup vinegar with a sink full of water. Soak for the afternoon. You may get a little bubbling action when you place the clothing in the sink, this is good. Remove and launder in the washing machine. Sorry I don’t have any tips for synthetic materials. Want smells and stains out of clothes try a 1/2 cup of sudsy ammonia in the wash .I had a den of cub scouts for years ..i have seen this trick take ground in red clay mud out of clothes ..they come out of the laundry smelling fresh and clean . I shop at thrift stores for most of me and my wife’s, clothes. I find that Tide with Febreze does a very good job of removing the Thrift Store smell form most clothing. You could probably use Febreze with other washing methods. I use the baking soda Vinegar method for other odors. Works well. I have had problems for a long time getting the sweat/odor our of my husbands t shirts until I found your site. I tried the 2 cups vinegar and 1 cup soda. All I can say is thank you, thank you, thank you! They smell sweet and clean! I’m rewashing his work shirts the same way today. Being a farmer he encounters many things that leave lingering smells along with his usual hard working man odor!! Just wanted to share a word of THANKS! Thanks for this post, I need to try some of these!! As weird as it may sound, I call our garage “the great deodorizer”. I have some old prom dresses I want to sell, had a pair of mildewed pants I couldn’t get the odor out of (and was early in our marriage and the internet wasnt a wealth of info like now), items ie blankets and luggage that get an odor after visiting a relative’s house (don’t ask), knockoff Uggs obviously warehoused with mothballs, so all of those I can put in the garage and I hang them or open them up and let them vent and, although it takes a month or so at least, it’s free! And I don’t have to try this and that, so of it’s out of season or I don’t need it right now, I stick it in there, and voila!! I don’t have to mess with it, run it here or there, and while I thought it might make everything smell like motor oil, it doesn’t smell like anything! (This was also borne out of necessity since we don’t have a secure, modearately protected outdoor space to hang clothes like your hang in the sun suggestion :)). And it doesn’t smell up the garage, either. i bought a pair of capri’s from Dot’s, they were going out of business so they were really cheap. times and soaked them in vinegar for hours. washed in cold, warm and hot.. tried everything. @alisa, I asked your question on my facebook and there are a few great suggestions. Just click this link and it will take you to the post. Absolutely! Use natural, unscented and non-chemically laden products for both odor control and your health. I am VERY frugal…but at this point I would wonder if the garment has been contaminated with a chemical you don’t want anywhere your skin. Your skin is your largest organ and able to absorb things so easily. If other suggestions don’t work well and completely I would say cut your losses and think of your health! That is an excellent point, Hope! I am afraid that I might have to do that. It is a very chemical smell. them don’t want any one else to get them. I have pillow cases and sheets that get a certain Smell from body oil. Put an automatic dish tablet in water and desolve it. Then put in the washer after it is filled. No other soap. Let go through a cycle. I always run it through twice. the second time with detergent. I cant detect any odor after they are dry. That’s great to know because I have the same issue with one of my son’s pilow cases. Thank you for these hints. I, too, am a regular thrift store shopper. I find that a simple air drying is the best way to remove the general thrift store smell, but if items have been washed and/or dried in fragranced products, odor removal becomes much more difficult. I searched today to see if tea tree oil would help with this and found your blog. I caution everyone about using fabric softeners! Fabric softeners are fat-based, and coat the fibers in your clothes and bedding. If the item already has a scent, I suspect adding that coating will merely coat the offending odor and seal it in. Furthermore, fabric softeners and dryer sheets (scented or unscented) contain dozens of toxic chemicals (most include formaldehyde!) that your skin will absorb when you wear them. Stay away from them, for both fragrance and health reasons. Thanks for this blog; I will be back! I never would have thought of using baking soda and vinegar in my laundry. I’ll need to try this next time I wash my work clothes. I know this is kind of a silly question. Can any of these suggestions be used to get smells out of fabric seats, or my couch? Yes, I can’t guarantee it, but I use it for my coach and car seats often. i often buy thriftstore items, being a low-income senior, but lately Goodwill’s clothing has retained a SICKENING CLOYING FAKE-Y STICK – particularly AFTER washing. This is too bad because I’m very sensitive and had to throw a number of articles away – even after a vinegar soak. I can’t hang things out in fresh air because the apt.bldg. where I live won’t allow it. Can people PLEASE start complaining to Goodwill about this (literally SICKening smell). I can tell it’s unhealthy. Help! Searching, I found this entry. Boy was I happy! Coming home today from our favorite thrift store, oh no, the smell! So I ran the shirts through a soak cycle with vinegar & baking soda in warm water. It appeared to have done the trick. I followed up with a wash and ended up only smelling the detergent. I have high hopes for after the dry! Someone suggested to me that this particular thrift store runs all their clothing through something for some reason. Sanitizing of a nature? Everything smells the same. Sometimes I can’t even stand to be in the store. I can’t say they wash them because sometimes there are new items with original tags that smell the same. YAY!! So glad to hear that it worked!! Yes, some of the thrift stores do have some sanitizing procedure that leaves everything smelling horrible, but hopefully, this did the trick. 🙂 Happy thrifting. I once got a shirt from a thrift store that had a strong perfume odor. It didn’t come out with anything I tried, and since I had nothing to lose, I soaked it in rubbing alcohol. It worked, and didn’t damage the fabric! No way! Rubbing alchohol? That’s so good to know.